Click on the Songs bar of the Library to list all the songs in the library. 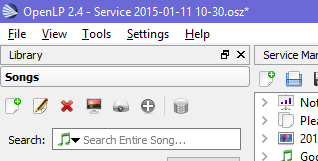 Scroll down or use the Search box to find the song you want to add, and click and drag it into the Service manager. If the song you want is not in the library, see Adding a new song to the library. If you want to see the text of a song, double-clicking it in the media manager will show the text in the preview panel. If you want to check or edit the words or the sequence of verses, right-click on the song in the service manager and select 'Edit item' (see right). To edit the words, highlight the verse you want to edit and click on 'Edit'. Save your changes when you are finished. Songs which have never been used at St Andrew’s may need some editing for OpenLP: see Adding a new song to the library for details. To edit the verse order, note the box at the foot of the window which lists the verse order, for example 'V1 V2 V3 V4'. You can edit this: for example to repeat verse 1 at the end, change it to 'V1 V2 V3 V4 V1'. A chorus will be listed as C1 and so on. Note that to help the musicians we have decided to mark the end of the last verse of a song with a # symbol. If the song ends with a chorus, this means making a copy of the chorus as 'Chorus 2' and adding the # to that. So the verse order might look like 'V1 C1 V2 C1 V3 C1 V4 C2'.